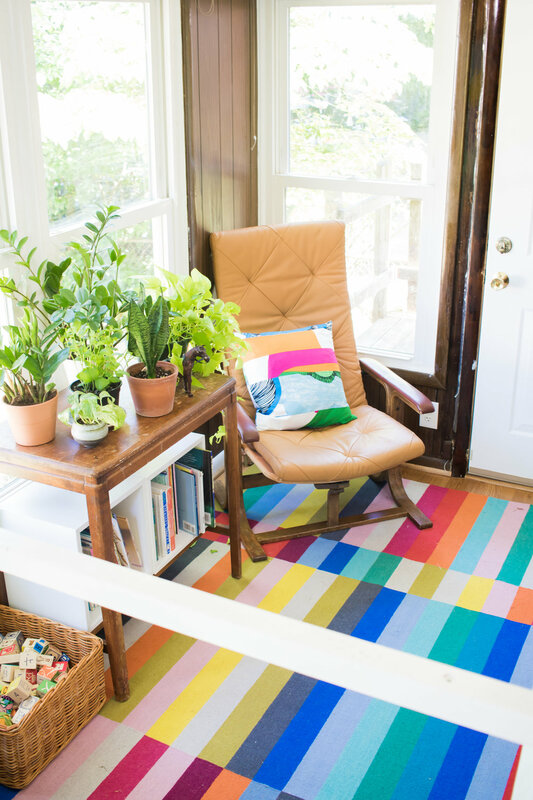 Our colorful sunroom with lots of IKEA. Happy Friday! As it is the first Friday of the month, I'm sharing about our home. 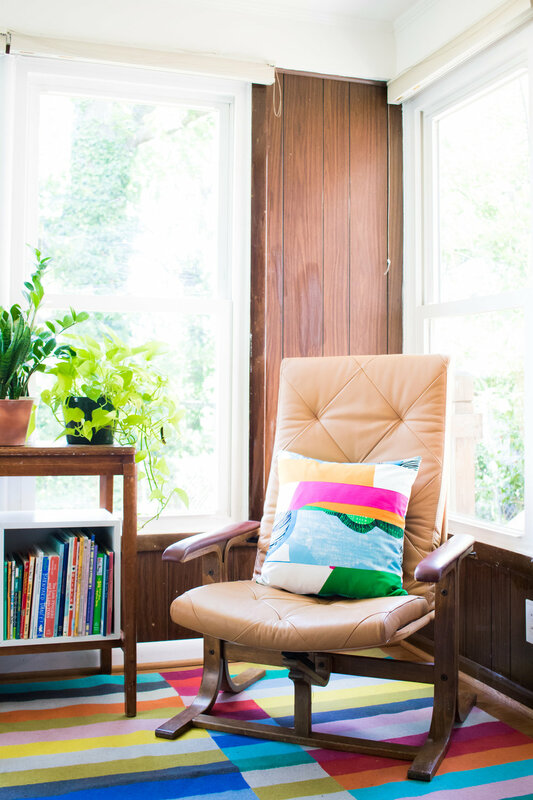 One of the best rooms of our house is our sunroom. It is right off of our dining room/kitchen, and gives us access to our backyard. It is always bright and cheery there, and is a wonderful place to take a nap! This is what it looked like before we renovated. The floor was spongy and carpet. Our contractors fixed the subfloor with new beams, replaced the insulation, and continued hard wood floors in here. We planned on painting the wood paneling, but we left it, and it keeps some of it's 70s vibe. This was the kids' reaction to the room. Ellie said, "You made this for us, mommy? I love it!" She only speaks in full sentences now. My little perfectionist. A rare non blurry picture of the kids jumping on the bed. Remember this little table we used in the dining room post? Well, we inherited an amazing cedar chest that works better in that space, so we put this table here instead. I used two square shelves from IKEA to hold books, and the kids love it. A picture of the room from on top of the bed. Isn't the rug great? It is from IKEA - as are most things in this room. It is so colorful, and is 100% wool - feels amazing under your toes. It is also only $150. The camel color seat cushion is also from IKEA. I made the cushion with strips of cloth also from IKEA and Marimekko fabric - the same combination for the curtains that line the bed. Zippers! Really, really easy - I promise. I have a feeling I'm going to be watching a lot of plays from this room! 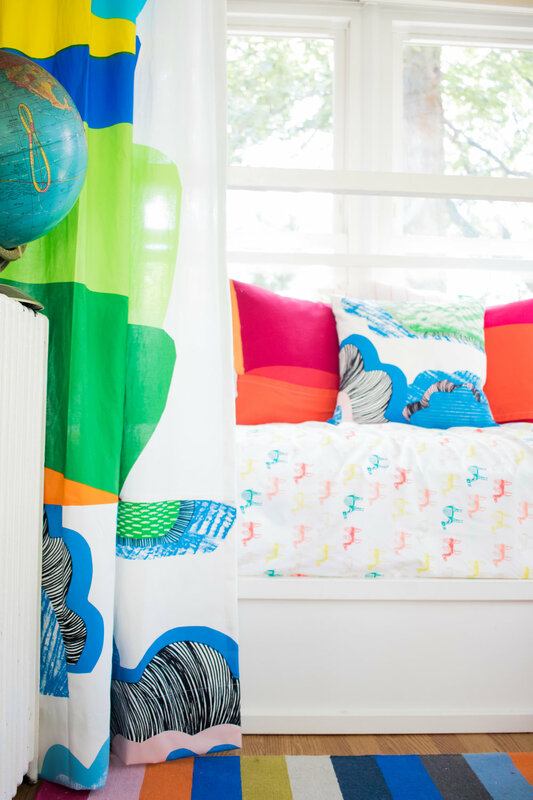 I made the curtains with a combination of the Marimekko Kippo fabric, and another great print from IKEA. I've seen people use the Kippo fabric as art just framed in a big rectangle. It's wonderful to have all those colors when you go into the room! My kids are the best sports - they smile and jump and look genuinely happy when I photograph them. I wonder how long that will last.